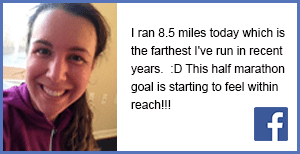 By TRR Team Member Rachael K.
Running a new race distance is a big deal regardless of the length. It takes careful planning, mental toughness, and determination. Sometimes it helps to hear about the experiences of others when you’re making the decision to start training. 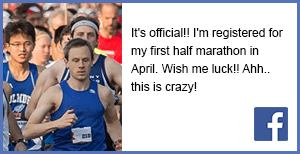 Here is Part 1 of my story as a first-time half-marathon runner. I never really planned to be a long distance runner. In high school, I joined the cross-country team literally one day before the fall season started. I hadn’t done a speck of summer conditioning and I just about died on the first day of practice. I still remember the cocky senior laughing at me as I panted in exhaustion. “This is nothing. We usually run much farther!” Barf. Still, the high school cross country team taught me basic technique and mental toughness for a lifetime of running. Fast forward to my post college days as a young adult. Running was something I did occasionally when I felt like it. I never ran more than a standard 3 miles. I gradually started going longer and longer distances doing a 5K, 10K and eventually a 7-mile marathon relay leg. Each new accomplishment felt amazing. That’s the great thing about running. You get this ‘high’ after a run that propels you into your next challenge. It’s like your brain purposely blocks out any moments mid-way through the run when you feel like you’re going to drop over dead. This past January I was determined to skip my typical winter runner’s hibernation period and stay active throughout the frigid days. The next logical training goal for me was a 10-mile race in the spring. I would force myself to train through the winter and early spring months. Still, the idea stuck with me like an annoying shadow and I found myself returning to the notion over and over again. How awesome would it be to reach that accomplishment? How amazing would I feel after such a race? 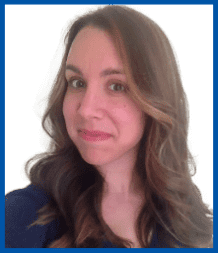 In fact, I had just watched the leader of the group, a good friend, spend six months transforming herself from a literal ‘non-runner’ into a half-marathon powerhouse. She was incredible! I could do that too!!! Right?? Right!! Oh my gosh…what did I just decide? It doesn’t matter where you find your inspiration, but you need to have it from somewhere. For me, I was driven by the challenge. I wanted to prove to myself that I could do it. Others may find inspiration from people in their lives or from a desire to be healthier. You can’t help but increase your muscle tone, improve your cardiovascular fitness, and lose weight when training for a race like this. 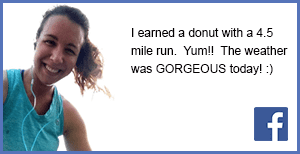 For instance, during my one 13 mile training run, I burned around 1400 calories! Yup… the scale was nice to me the next morning. When I first made the decision to train for a half-marathon I was afraid to really tell anyone. 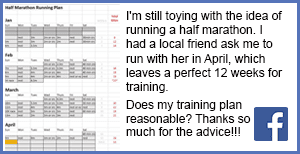 I shared the idea with the ladies in my Facebook fitness group to get their feedback on a training plan. I spent hours at my computer adjusting mileage from week to week so I could gradually work my body and mind up to the required distance. I also did research on new equipment I’d need, common problems, and the event I was aiming for. Still, I didn’t really tell anyone that I was doing this. It’s like I was still trying to convince myself. I knew my body was capable, but I just had to convince my mind that I was going to do it. That planning stage is crucial for your health and confidence. Take the time to ask people their advice and make a plan that you feel comfortable with. 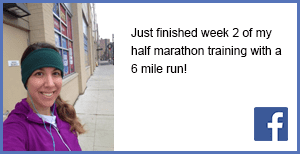 I chose to use a 12-week training plan because I was already running 6-7 miles comfortably when I started. Others may want to extend that training plan to 6 months or longer. The most important thing is to not go too far too fast. It’s a sure way to cause yourself injury and give your confidence a huge blow. The 10-percent rule says that you shouldn’t increase your mileage by more than 10 percent over the previous week. I did my best to stick to this rule. So I finally told my family and a few select friends and I was ready to go. Training was officially underway for my first half-marathon just 11 more weeks away. I consider myself fairly well informed on many topics in the fitness world, but running this length of race was new territory for me. I started off running 5 days a week with rest days on Monday and Friday. Early on, the runs were between 2 and 4 miles with a long run always on Sunday. I made it to week 5 before injury struck. My left knee was NOT happy. Notice how I said I was running 5 days a week? Yeah… there’s the problem right there. I was neglecting my cross-training and strength training because running just seemed like more fun. As a result, I wasn’t keeping those muscles in my hips, core, and back conditioned enough for the training plan. Plus, I was subjecting my joints to 5 days of high-impact workout without any sort of rest. Week 5 was a tough time. I was feeling really discouraged and mentally berating myself for my mistake. If injury strikes, you need to take it very seriously. This is your body telling you that you are doing something wrong and need to make a change. Don’t just ‘push through it’ and hope it magically fixes itself. If you don’t change something about your plan, equipment, or technique, the injury will only get worse. I took a solid 10 days off from running. During that time, I rested, did light cross training, and weight lifting. I only returned to running when I was confident that my injury was better. My knee pain is a bit of a recurring thing that stems from an old injury, so I was familiar with what was going on. If you’re experiencing a brand new pain, then it’s always a good idea to check with a doctor and make sure it’s not something more serious. 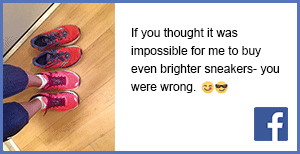 One of the changes I made during week 5 was to go buy new shoes. My old shoes were about 7 months old and the foam cushioning was collapsed and worn. I am a very flat-footed person, but I tend to supinate and carry most of my weight on the outside of my foot. Over time, the outer sole of my shoe gets worn away so that I’m basically running on a slanted surface. Talk about bad for the knees. I also took a serious look at my running plan and refocused my conditioning. I added core exercises to each of three runs and also created two strength training workouts to be used on the cross-training days. Those cross training days could now also include time walking on the treadmill at a high incline and time on the elliptical. More exercise focused on my hip adductors and abductors were going to help strengthen the parts of my knee that were in pain. Plus, daily roll out sessions with a foam roller were going to keep my muscles lose and keep my blood flowing for active recovery after each workout. I was able to make these changes after a conversation with a trusted athletic coach. If you’re running your first serious race, make sure you have someone that you can go to for advice and guidance. A training partner is also an excellent idea if you can find one. Share Your Thoughts: Do you have any experiences or advice to share for first time half marathon runners? Comment below.